Let me introduce you to Peter Rabbit. I mean, he’s big enough, he should have a name, right? One thing I love about having a little girl is the cutsie things my husband comes up with. 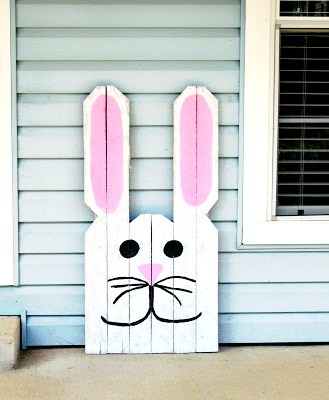 This project was all him, I just painted the face on our DIY pallet easter bunny. 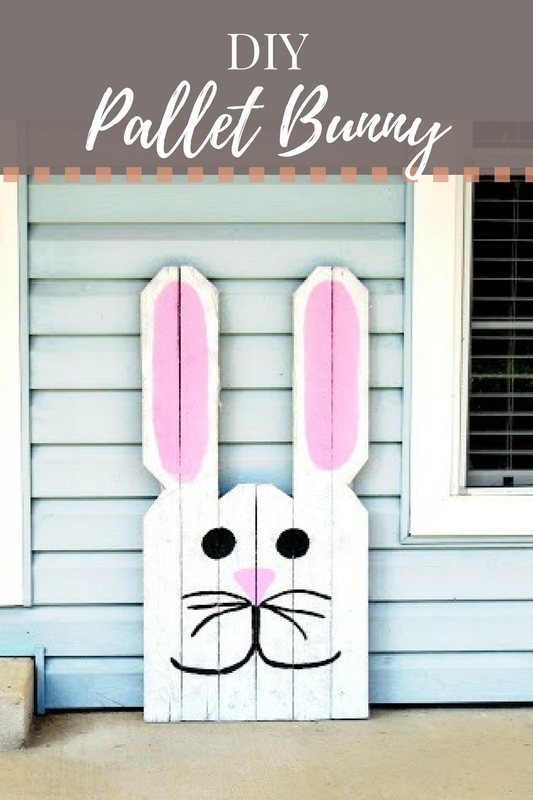 So naturally, I have no good pictures of Peter during the creation process, but I’ll step you through exactly how we created the pallet easter bunny. Start by taking an empty pallet, the larger the better for this project and dissecting it. Now envision yourself in 8th grade biology and frogs, ew gross, that went the wrong direction! You’ll want to put this pallet back together using part of it in the back to brace the pieces together. Next, he just free-handed the bunny outline and used a jigsaw to cut it out. I went back with whatever white paint we had on hand, I think this was door and trim paint by Sherwin Williams, and used craft paint to fill in the eyes, ears, nose and mouth. It took me all of 20 minutes to give him a bunny face-lift. Now he’s the cutest little pallet Easter bunny this side of the Mississippi. Look at baby Aspen checking out Mr. Peter Rabbit from the window. Cute little stinker! 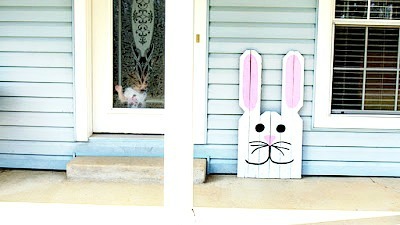 Want more fun holiday DIY’s, check out the project tab at the top of the page. Too, too Cute! Love this idea. Thanks. Well this little bunny is the cutest little guy. How very cute. I love one-piece outdoor decorations that make a big impact. Pinning now. Thanks for sharing at the This Is How We Roll Link Party.